There is so much awesome I want to talk about in this post. First off, we’re dealing with one of my all time favorite pedal companies – Earthquaker Devices. I currently own a Dispatch Master (which I admittedly use too much) and for a brief time (had to give it away damn it) was lost in the Disaster Transport SR.. amazing pedal!!! Pedals and Effects is also one of my favorite channels with Juan Alderete. Love watching his videos, and you should definitely subscribe to his YouTube channel! Nick Reinhart is the guitarist of an amazing band – Tera Melos.. and he is a guitar/pedal wizard!!! 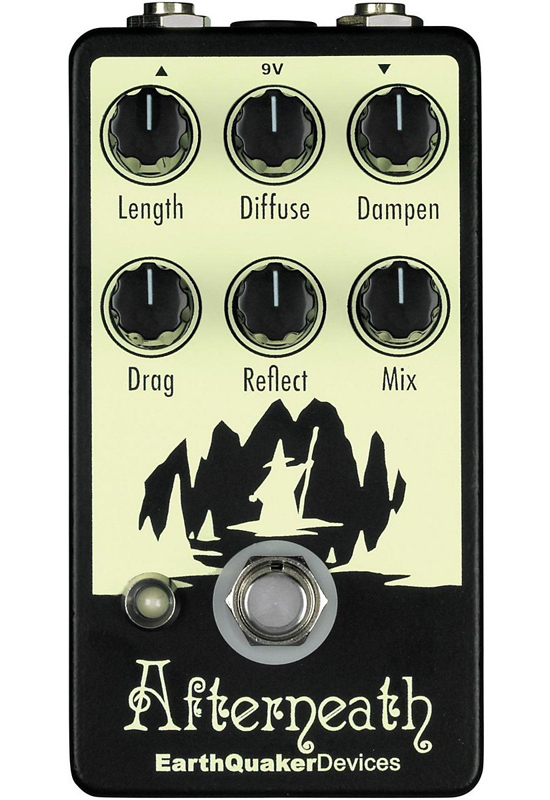 And finally.. we’re talking about the Afterneath pedal from Earthquaker. This is on my short list of pedals to get in 2015. Similar to the Dispatch Master, the Afterneath takes reverb and delay to a new, awesome, weird, creative direction. What I like about Earthquaker, they inspire me to create weirdness. I really appreciate their style of sounding ‘unique’. You can pick up the Earthquaker Devices Afterneath for $225 at Amazon.com. If you own an Afterneath, please drop us a comment and let us know what you think! Nick Reinhart of Tera Melos on Pedals and Effects EarthQuaker Devices Afterneath Otherworldly Reverberator TC Electronic Hall of Fame and Flashback Delay EarthQuaker Devices Disaster Transport SR Give Away! Their pedals are so awesome. I too love love love the Disaster Transport. The delay is lovely but clicking on the modulation just takes it somewhere else entirely. Most of the other pedals are just too untameable for me but oh so sick. I have been on a quest for a synth pedal and only recently determined that my only qualification is that it track superbly. That said, the Bit Commander sounds totally amazing when it is not glitching horribly out. I just got rid of mine because I figured out a way to get a similar sound using, an EHX POG, EHX Mole, Solid Gold FX Beta in a parallel effects loop with the other loop containing a Donner Fuzz, Boss DS-1, all going into a chorus pedal. It takes that many pedals to come close to the sickness of the Bit Commander.